At the height of the Cold War, officials at the Ministry of Defence conducted a highly secret investigation into unusual events that occurred along a strip of rugged coastline within the Pembrokeshire National Park nicknamed 'The Broad Haven Triangle'. The events made national headlines: lights and objects hovering in the sky, ghostly figures peering into farmhouse windows, cowering animals, and poltergeists plaguing a terrified family of witnesses. Thirty years later, official files pertaining to these occurrences were finally released for public scrutiny at the National Archives. The disclosure prompted a new witness to come forward to speak of what he knew. His testimony rocked the very foundations of the British Government. Neil Spring was born in South Wales in 1981. He started writing at the age of twenty-eight. Neil is Welsh and lives in London. 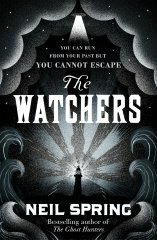 The Watchers is his second novel. Makes the extraordinary and surreal feel immediate and real! Total thrill ride of a book. Once started , its hard to put down. Loving Neil Spring. His books keep you up until the early hours. I loved this book and it deserves to win.